Use these credits during runs on HQ. X is the number of virus counters on Pheromones. Whenever you make a successful run on HQ, place 1 virus counter on Pheromones. There are quite a few tricks you can pull with this card. -You can use the recurring credits to trash assets that you access in HQ, or on PSI games. -You can use the recurring credits to pay to remove Tags from siphon or vamp with NACH during the Run. -You can absolutely Vamp people using these credits. 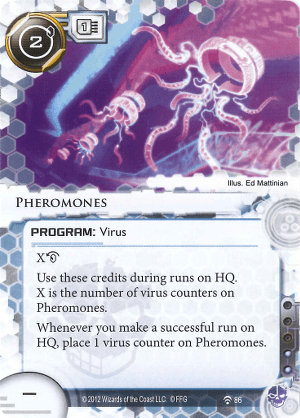 Finally, the somewhat odd nature of this card regarding virus counters and recurring credits needs to be clarified: At the start of the turn after the corp purges virus counters, the recurring credits stored on pheromones from the previous turn are not removed. I feel like I finally made decent progress with this card when I built a Gabe deck using Cyberfeeder, NACH, Vamp, Siphon, Central Breakers, Djinn, and Lamprey. Every card in here is good in Gabe already except Djinn, which can totally tutor out lampreys or host your sneakdoor. That's not even to mention the MU cost, or the cost to install it. I could potentially see this card being somewhat useful when you really want to be able to ensure at least one HQ access a turn (playing Silhouette or Gabe, Emergency Shutdown, etc). However, this card is very slow, and I would think works best in a control deck looking to build inevitability, rather than Criminal's typical blitz assault. The good: Provides lots of recurring credits during runs on HQ. The bad: Incredibly slow to act. If you Install, Run, Run, Run, you don't see any benefit until the next whole turn. The ugly: Purge virus counters. It's a neat idea, but even with the synergies above, it still feels like a weak card to me. In the new meta after rotation and the introduction of the revised core set Pheromones is looking better than it used to. Runners now have less economy due to all the banning and restricting going on with MWL 2.0 so economy cards are more valuable than they used to be. Pheromones is useful for criminals that get into HQ regularly (which is to say: winning criminals). After a few runs or just one run and a few turns the recurring credits will have outweighed the install cost. A Pheromones with just 2 is a two credit per turn income source, though you can of course only use those credits while running on HQ. Being a virus program Pheromones is vulnerable to things like Macrophage, Cyberdex Virus Suite and plain old purging virus counters. Macrophage is probably the biggest issue, it's a silver bullet against viruses and when placed in front of HQ is likely to nullify the economical benefits of Pheromones. Cyberdex Virus Suite is a bit of a pain but if you hit it in HQ at least you can trash it. Just beware of running archives when CVS is in there. Purging is the least of your worries. At the very least that free turn you get is worth 4 and of course you could try to run HQ again to get some counters back on Pheromones. Oh and of course a free turn could be exploited for all kinds of criminal mischief, you're a criminal, right, think of something. In anarch Pheromones might see some action as well given that it's reasonably priced and combines well with other anarch cards. Pheromones on a Progenitor kickstarts the economical benefits and anarchs have other tools for getting virus counters onto cards as well like Virus Breeding Ground. Combine Pheromones with Fester and the whole purging thing becomes less likely. Combine it with Incubator and you have at least one run cheaply. With Lamprey HQ runs are both cheaper and cost the corp money (be sure to add Ixodidae in the mix if you do that). And with Hemorrhage you can make the corp dump cards before you access HQ, increasing the chance of hitting agendas (corps are unlikely to dump agendas in archives against anarchs, so they'll probably discard other cards).